I received a request for a medical school invitation with a white doctors coat, pink shirt and pearls from a client that I work with all the time so I just had to work an a design for her. Since I was making an invite for a female, I wanted to make a matching invite for a male. 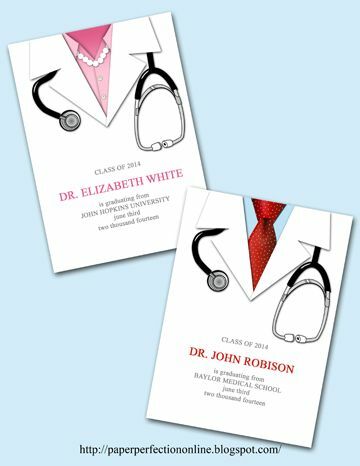 These invitations can be used not only for medical school graduation but also for a child's doctor birthday party. I can personalize them with any type of wording you might like. If you are interested in this design or would like a custom design contact Paper Perfection at jtanddolly@yahoo.com for pricing and details.